This is the story of the $50,000 pony. Ok, so he didn’t exactly start life as a $50,000 pony. Truth be told, the little guy fetched only $500 at the Friday night sale at Thurmont. When the cowboy, a gangly kid of maybe 12, neck reined the not yet 13-hand black pony into the auction ring the serious bidding started. My youngest daughter needed a pony, so we stepped up and won the auction for him that night. 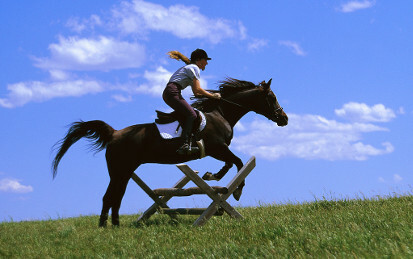 Anyway the point of this story is to humanize the economics of the equestrian industry – especially here in Loudoun County – home to more horses than any County in the Commonwealth of Virginia and ranked 34th among counties in the U.S. A recent study by the Virginia Department of Agriculture reported 15,800 horses with a value of $294M or $18,650 per horse. Horse owners here in Loudoun spend between $4-5,000 per animal – thus a $70-90M economic impact. When non-horsemen try to understand the horse industry they may think of horse racing or of manicured farms. In reality many horsemen, and women, are ordinary folks with typical jobs. Their love of horses and pleasure in the lifestyle related to owning horses is a motivating force in their lives. So how did a little black pony come to cost $50,000? When we bought the pony we already had the Suburban and a 2-horse trailer – acquired for other ponies and horses in preceding years. The farm, 32-acres in central western Loudoun, included some paddocks and open land bordered by the North fork of Catoctin Creek. With the new pony came a new paddock, a barn addition to store hay and an upgrade in both truck and trailer. The pony needed company while traveling and taking many horses to a show makes for more horse fun. Some time after “Black” arrived at the barn he acquired Potomac Horse Fever. Quick diagnosis by the veterinarian and barn manager caught the disease in time for treatment. After two days at the Equine Medical Center in Leesburg “Black’s” direct cost rose to $2500. My daughter rode Little Black for several years until she out grew him and he retired. He enjoyed his retirement and has now passed on. We couldn’t count the actual cost of ownership but when one considers all the costs of farm and barn ownership, horse care, and new shoes, more frequent and expensive than the child’s shoes, you quickly realize the true economic impact of the equestrian industry. This example also represents farming in general. There are some obvious costs associated with a farm business but the multiplier effect of all the activity surrounding the farm is tremendous. When government decision makers question the value of the rural economy just tell them about the $50,000 pony.